This is not my grandfathers church - or yours either. And, it's not My Grandfather's Church, either! My name is John M. Kohlenberger. I am the only local living founder of this Mystical Spiritualist Church from California. This church, currently in Prescott and Prescott Valley Arizona, is not like your grandfather's church. It is also not anything like my grandfather's church! And, he was the Pastor zt a couple of churches in central and southern California. In my case, "Not my Grandfather's church" is not just a figure of speech! At an early age, my grandfather, John W. Kohlenberger, left a Catholic monastery (in Germany) where he had hoped to become a priest. As a boy, he had tripped, while carrying a water jar from the town well to the monetary and the jar broke. After receiving a severe reprimand, including a beating for tripping, he said to himself, "My God doesn't treat people so brutally for a simple accident." So he left the Catholic church in search of something better. Eventually, being from the old country (as most Americans were in those days) he became a German Methodist minister and imagrated to the USA. Grandfather John's first church was in Santa Cruz, CA. You can see a picture of his 1890s church below. NOTE: My grandfather, the minister, is the little guy on the right, in front of the fence. 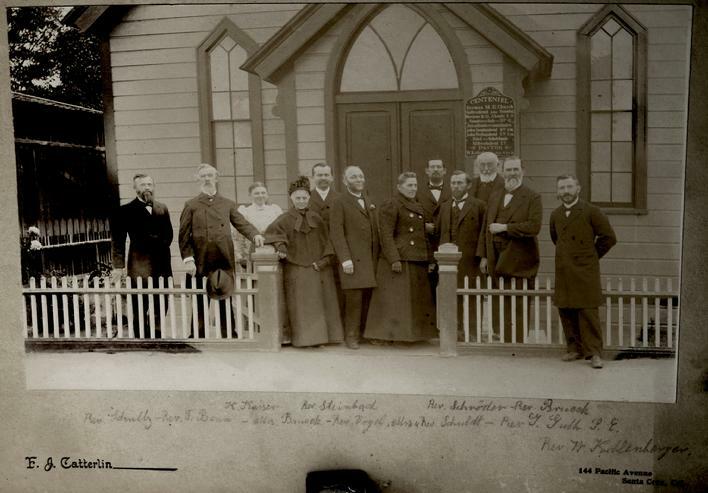 Grandfather's Santa Cruz church and its members at the turn of the last century. In about 1907, Rev. John W. Kohlenberger moved to Anaheim CA., near the rest of his family. There, he was the pastor in the church that, until the 1970s, sat in the triangle of land between Los Angeles Bl, Lemon St and La Palma Bl, next to La Palma park. Progress has since eliminated both the little church and the triangle of land that it sat on. The Santa Cruz church building was still in existence a few years ago, being used more recently as a Yoga Studio. This picture was taken by my nephew, Bob, who lives in the Santa Cruz mountains nearby. 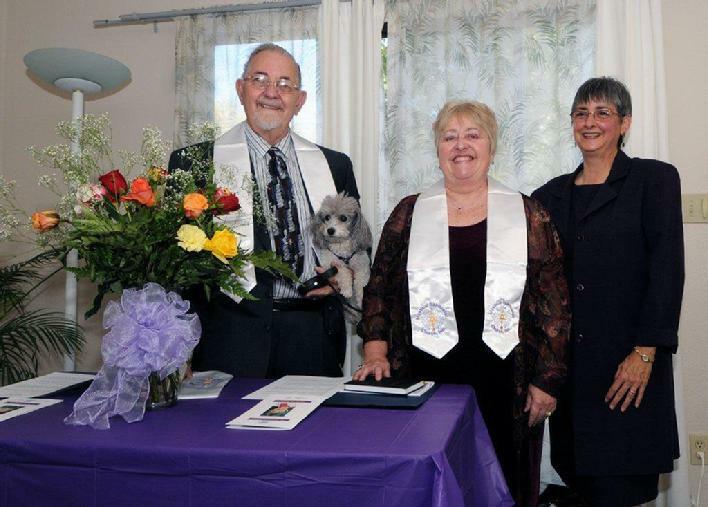 BELOW - is a picture of our ordained ministers as of the Fall of 2012 in Prescott Arizona. Another way that this is "not my Grandfather's Church" is that he used a Bible as the basis of his teachings, while we are of the "Charismata" school; using our hearts for divine inspiration, teachings, healings, prophecy and more, such as Paul mentioned in I Corinthians 12 and 13. Yes, we have psychics, energy healers and even mediums who actively participate and support our services and activities, much like many of the early churches before Rome took over church rule, which lead to General Constantine organized the "Orthodox" church with affirmations, doctrines, creeds and liturgies. This church rents space in public buildings, similar to what Constantine did, early on. However, in our case, it helps to remember that a church is not only based on what is in our hearts, rather than a book, but also that it is about the people and not a building or finery/ We believe that our treasures are (as Jesus said) in our hearts. And, in the tradition of some of the early churches that still honored God-Goddess in nature, we usually have a pot luck at the change of the seasons. On Epiphany (January 6th) of 2013, Rev. Martine Kohlenberger, shown in the middle of the above picture, began her process of moving on or "Graduating" beyond our self imposed restrictions of expressing only through a human form. Then, on January 30th she graduated into the Greater Light of Unconditional Love, Living and Light. Martine is now my (and our) angel helping not only with this church, but with one or more channels here on earth in Arizona, to speak in French - her native language. So, these mediums and channels or spirit communicators will be "speaking in tongs", as you can read about in 1st Corinthians. Throughout 2016, this church has been trending towards being less structured. The gaterings around Jesus were often spur of the moment. Early Christians met in homes and valued different books. Christianity was not well organized before the 4th century, when Constntine and others brought structure to what had before them been very free and unstructured. We continue in the traditions of the early Charismaatic churchs, but modernized. Over the lifetime of this church, our speakers have increasingly been sharing ("Witnessing" in Christian terminology) the work of spirit as it has exhibited in their lives. So in 2017 the people that are drawn to our activities, many themselves, have strong mediumistic talents and skills, as Jesus and many in the "holy" family (all were Essenes) did. So, we will be demonstrating, first among ourselves then in the community, the benefits of not just Bible reading or prayers, but what true spiritual attunement can bring to humanity ... regardless of race, sexual orientation, religious affiliation (or none), political party, or any other man-made separation from the rest of humanity and the family of God-Goddess. We're all one family! Let's look for what unites us (love is the greatest uniter) reduce the borders, boundaries and barriers and come together (as a UNITED States) so we can and will love one another like the Spiritual Family we all are a part of! Loving one another is NOT a "Mission Impossible"! In some ways, we resemble the early churches, as they were formed by Jesus' brother James, Paul and others right after the crucifixion. We are charismatic (being inspired by the living spirit instead of reading words from some musty old book). And, like the early churches, we have periodic potlucks. Though many of the early churches had communal feasts once a week, we normally do this quarterly with the change of the seasons. Though we don't always call each other "brother" and "sister" or kiss upon meeting, as many of the people in the early churches did, you may receive, or share, greetings and hugs at our gatherings. After all, we're all "family", for we're all made of the same stuff, breathe the same air and drink the same (recycled) water. As has been said of old, "In God We Are One" and when you know yourself in spirit, you'll know our oneness ... without loosing your individuality. Life Is Forever and ever changing, growing in Love! While our focus is on Inspiration and healing, we see God as being alive within every person, as many of the early church leaders did. Thus, I like to think of this church as something like The First Unorthodox Church of Prescott. Not deceased, as she still lives in our hearts. NOTE: If clicking on these links does not work, you can copy/paste the web addresses into your web browser.